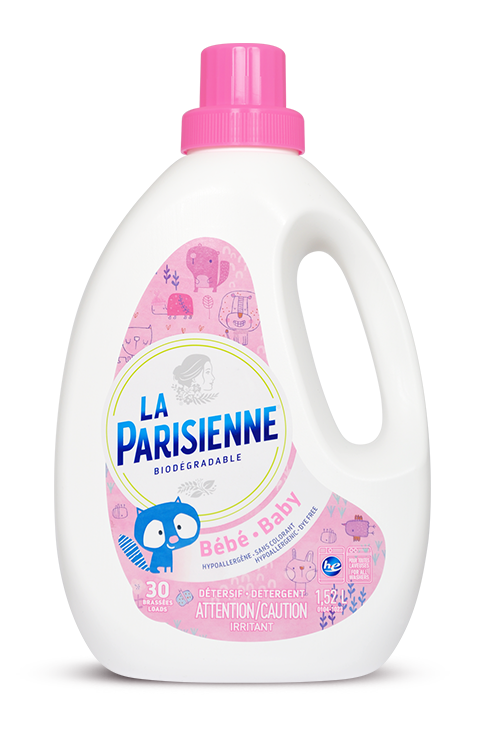 La Parisienne BABY detergent is specially designed for baby clothing and linens. Its dermatologically tested hypoallergenic formula is tough on stains yet non-irritant for you little one’s skin. Is safe for all types of fabric and all colours. – Always make sure stains are gone before drying your laundry. Stains are always harder to remove once they have been machine dried. – If stains remain after an initial washing, soak your clothing with liquid detergent again or apply detergent directly to the stain. Rub and wash again. Did you know that traces of chemicals can linger on some new clothes? We recommend washing new items, especially baby clothes, to remove these potential irritants. And, with our hypoallergenic fabric softener, you can air dry them without compromising softness!